There’s a 52 percent chance that a low-income black man has been behind bars. The American criminal justice system’s glaring racial disparities are well known: Black people make up nearly 40 percent of America’s incarcerated population and are more than five times as likely as whites to be behind bars. A new paper from the People’s Policy Project, a progressive think tank, looks at how economic inequality exacerbates this longstanding racial divide. Using data from the National Longitudinal Study of Adolescent to Adult Health, which has tracked a representative sample of Americans since the mid-’90s, Nathaniel Lewis finds that the incarceration gap between blacks and whites is primarily driven by economic disparities. He concludes that one’s class, more than race, is the single greatest predictor of how likely someone is to land behind bars. Our jails and prisons are mostly filled with America’s poor. (In 2014, 57 percent of incarcerated men, and 72 percent of incarcerated women had incomes below $22,500 before they were locked away.) Many of them are white, but a stunningly disproportionate share are black. 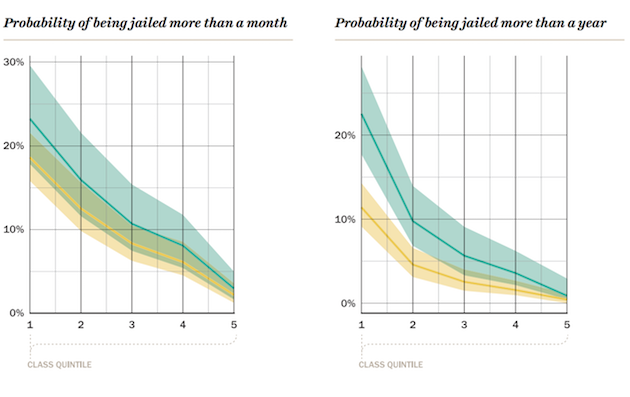 As Americans move up the class ladder, their odds of being incarcerated start to drop dramatically. White men in the lowest income quintile have a more than 40 percent probability of ever having been jailed, Lewis finds. In contrast, the probability for white men at the highest income level is 9 percent. Since black people are far likelier to be impoverished or low-income, they’re also far likelier to be locked up. The probability that a low-income black man has been jailed is around 52 percent; for an upper-income black man it’s 14 percent. The roots of black folks’ economic disadvantages run deep. Across nearly every measure of economic well-being, black Americans remain years, even decades, behind their white counterparts. The racial wealth gap alone has yawned to point where the black families would need over two centuries to catch up with the wealth amassed by white families. The following chart illustrates the slice of black and white men in each income group, as divided into quintiles. 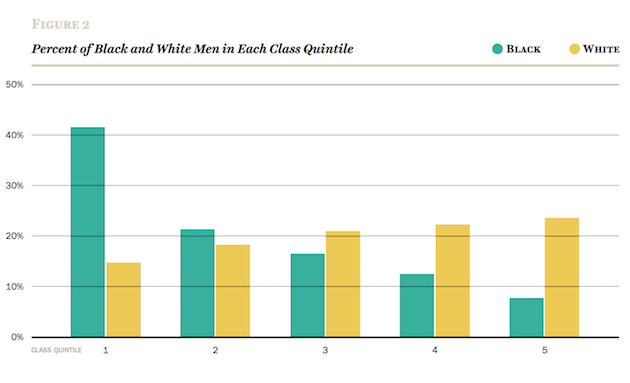 Black men, for example, are more than twice as likely to be in the lowest income quintile than white men; and white men are more than twice as likely to be in the highest. To test his thesis, Lewis crafted a counterfactual in which there are no economic differences between white and black men. By taking class out of the picture, we can actually see more clearly how class drives these outcomes in the first place. Once class is removed, the black-white incarceration gap begins to vanish, though never entirely. 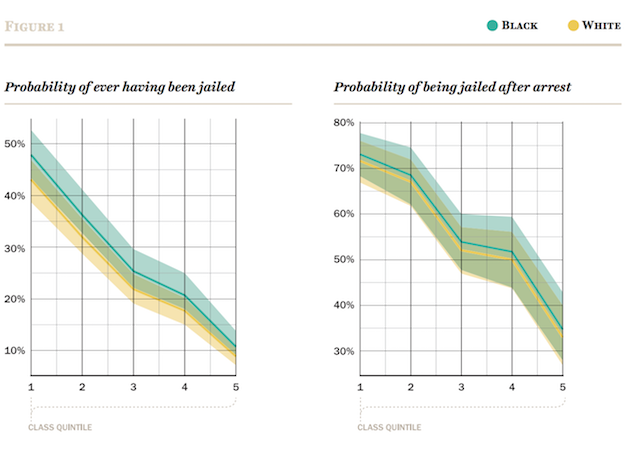 Lewis calculates that class explains more than half of the difference between the share of black and white men who have been jailed for more than a year, and explains 85 percent of the gap between those who had been jailed after arrest. In other words, if economic background had played no role, far fewer poor black men would be imprisoned. The paper does not argue that eradicating economic inequality will vanquish racism or the racism that infects the criminal justice system. What it does argue, in the tradition of scholars like Cedric Johnson, is that the criminal justice system isn’t a standalone widget but a piece of a much larger machine. In order to reverse the stunning rate of black incarceration, Lewis finds, we have to address the poverty that pushes so many black people into prison in the first place. He concludes, “[T]hese disparities are primarily driven by our racialized class system. Therefore, the most effective criminal justice reform may be an egalitarian economic program aimed at flattening the material differences between the classes.” In other words, while building a more progressive economy won’t end the horrors of racism, it may be the pathway to a less discriminatory criminal justice system.